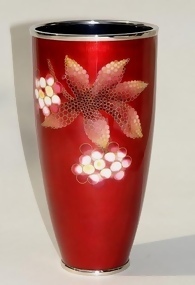 A stylish cloisonné (shippo) beaker vase by Ando, 10” in height, circa 1950 – 1970. It has the original box with a pamphlet issued by the Ando Cloisonne Company, the leading cloisonné company in Japan. The note briefly introduces the company, how their cloisonné are made (with photos) and a photo of the very famous enameled mirror discovered in *Shoso-in. *The Shoso-in was originally the storehouse of the Todaiji temple. It has 9000 rare articles well preserved from the 8th to 9th century, Nara and Heian period. Among the treasures are around 700 articles donated by the Empress Komyo after the death of her husband, Emperor Shomu, in 756. There is an exhibition open to the public held once a year in late October for two weeks. 70 National Treasures will be exhibited this year. The treasures of Shoso-in includes documents, stationery items, furniture, musical instruments, toys, Buddhist altar articles, weapons and armor, tableware pieces, clothing and accessories, carpentry tools and medicinal herbs.